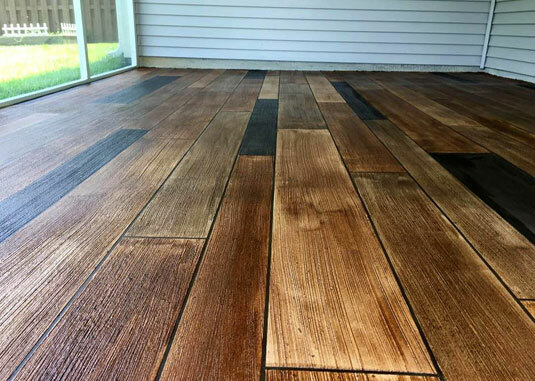 Love the look of a rich wood patio or floor but hate the maintenance, water sensitivity, and longevity concerns? We have the solution. Wood stamped concrete in Boise, Idaho is an economical and long-lasting solution to get the beautiful look and texture of authentic wood grain for your indoor floors, pool deck, patio, and walkways. Concrete floors that look like wood offer the best of both worlds: the beauty of wood planks yet the durability and long life of concrete. How Does Wood Stamped Concrete Work? A concrete wood floor looks like wood but it’s actually a technique called stamped concrete. When a concrete slab is poured, it’s stamped with a specially designed wood plank stamp before it can completely set. This creates a realistic imprint of a wood plank in the surface, complete with an authentic texture. It isn’t enough to have the texture of wood, however; we combine the stamp with dry-shake or integral color and surface-applied stains. This creates natural variations in color that closely mimic real wood. Wood concrete flooring in Boise, Idaho very closely resembles wood but it’s even better because it comes with the strength and resilience of concrete. The floor will not splinter, rot, swell, or suffer insect damage. It will be just as strong as a regular concrete slab. Here are some of the biggest benefits our clients enjoy. Wood and paver floors, patios, and pool decks can be very expensive in terms of labor, materials, and upkeep. Stamped concrete that looks like wood doesn’t cost much more than a regular slab of concrete and far less than labor-intensive materials like pavers and wood. Getting the stamped concrete wood look in Boise costs just a fraction of the cost of wood. Its long life and low maintenance needs also reduce long-term costs. Perhaps the biggest advantage of a concrete wood floor over traditional wood planks is it’s incredibly durable and requires no special care or maintenance. Even though it looks like wood, so-called “concrete wood” is weatherproof, long-lasting, and free of problems that plague wood like mold, mildew, warping, scratches, gouges, insects, splinters, and wood rot. 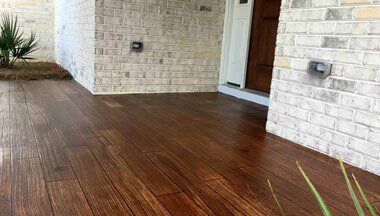 Our wood concrete flooring is the ultimate in easy-care flooring inside and outside the house. Indoors, it can even hold up to frequent foot traffic, pet claws and accidents, moisture, and more. Wood patios and walkways can last up to 15 years with careful maintenance, cleaning, and regular staining. Our concrete that looks like wood comes with the same luxurious look and feel but it can last 25 years or more with almost no care. Wood stamped concrete in Boise, Idaho lasts just as long as regular concrete with even better performance against stains and minor cracks. Call now and get a free quote for Wood concrete services. Considering concrete floors that look like wood for your home or business? Do you have questions about installation, longevity, and maintenance? We are just a phone call away! Here are a few common questions from our customers but please give us a call with any additional concerns. 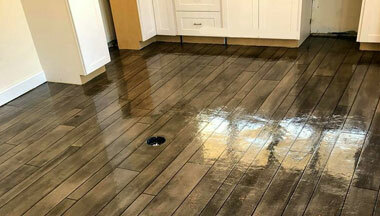 Q:Can I get a free estimate on a wood stamped concrete floor? A: We are happy to provide a free written estimate for a wood concrete floor in Boise and surrounding areas like Meridian and Caldwell. Please give us a call to request a free estimate for your project. This may require an in-person evaluation of your existing floor or space to provide the most accurate estimate possible. Q: Can concrete that looks like wood be installed on existing concrete? A: Yes! As long as your existing concrete is in good condition, we can update its look with a concrete overlay. This involves applying a new layer of concrete to the existing slab and stamping it with special wood plank stamps. This creates the same look as a conventionally poured concrete wood floor in Boise. We can install a concrete overlay on a driveway, patio, walkway, garage, or basement. Q:What are the biggest benefits of concrete wood flooring? A: Whether you are considering stamped concrete that looks like wood for your outdoor patio, pool deck, driveway, or even an interior floor, this choice comes with many advantages — especially when compared to traditional wood planks. 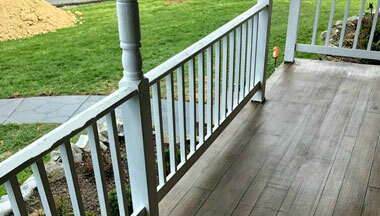 When it’s used outdoors, our stamped wood concrete solution is extremely weatherproof and lasts much longer than wood. It will never rot or splinter like wood yet it offers the luxurious look and feel of wood planks. Boise wood stamped concrete is also an economical alternative to real wood, particularly when you consider long-term maintenance costs. Q: Will my concrete flooring crack? A: All concrete eventually cracks to some degree, but there are many ways to minimize and even disguise the appearance of these cracks, particularly when concrete is professionally installed. A concrete wood floor is a durable solution that is very resistant to cracks when it’s installed correctly. In most cases, cracks will be tiny. The detailed stamped pattern of a wood stamped concrete slab will also make it very difficult to notice these cracks because they will be hidden in the wood grain pattern and lines. If your concrete floor does develop noticeable cracks, we can help with repairs.